When you think of Albert Brooks, most don’t think “tough guy.” But after his stellar performance as Bernie Rose in Nicolas Winding Refn’s Drive, I think Brooks might have a lot of casting directors calling. At least I hope they do. Because I’d love to see Brooks take on more movie roles as he’s been very selective over the past decade. Anyway, the other day I spoke to Brooks and we talked about a wide variety of subjects. We discussed why he agreed to take on Drive and his response to the critical success. We talked about just how much he improvised in Martin Scorsese’s Taxi Driver, the possibility of Defending Your Life coming to Blu-ray, his thoughts on Finding Nemo getting a 3D re-release, and the roles he turned down that he still thinks about. Finally, I asked if he plans to direct another movie. Hit the jump to read or listen to the interview. He took a break from Hollywood for a while after the exhaustion of putting out Looking for Comedy in the Muslim World. He took the time to write 2012, and when he was offered the part in Drive he felt it was a chance to come back to movies in a very different way. On Taxi Driver, they rehearsed in a hotel room for two and a half weeks. During rehearsals there was improvisation, and they took what they liked and put in into the script, so there wasn’t a ton of improv on the actual set. A lot of the dynamic in Drive came from the cast. When Ron Perlman was cast after Brooks had signed on, he realized that their relationship in the film is like George and Lennie in Of Mice and Men. He doesn’t know how the decisions are made regarding getting Defending Your Life on Blu-ray, but he says he’s been trying to get more of his movies on Netflix Watch Instant. Regarding writing and directing another film, he says he’d like to take a couple of years to play some really cool parts after getting his chops wet on Drive. He turned down parts in Dead Poets Society, Big, and Pretty Woman. He really wanted to play the Burt Reynolds role in Boogie Nights but was already in pre-production on his own movie so he had to turn it down. Below is the full transcript. You can also click here to listen to the interview. Collider: Drive was your first film since 2005. What made you say “yes” to this one, because I’m sure you’ve been asked to do other things? Albert Brooks: Yeah, I got tired of the same thing. When I made my last movie, which was Looking for Comedy in the Muslim World, to be honest with you, the release part of it with Sony forcing me to change the title and then going with Warner Independent, it was such a rough ride that I just needed a breath. I got sorta disillusioned. So I started writing the novel that I finished last year and I found that to be exhilarating in terms of a writer. Then I’d get offered stuff and it felt like a bad version of something I would write, ya know? I didn’t want to play a stupid part in a comedy so I just took myself out of it for a while and wrote this book every day. Drive came to me because the casting director knew my manager and called and said, “You’ve always talked to me about Albert wanting to play the heavy. I think he should read this.” My ears just perked up. It was a chance… if I hadn’t done something for a few years, it was a chance to at least come back in in a whole different way. That made me excited, so I took it. You improvised some, if not a lot, of dialogue on Taxi Driver. If you did improvise as much as I think you did, do you get some sort of card…when [Martin] Scorsese allows you to improvise, do you get to improvise on every future project? Brooks: [laughs] No. That’s funny! Did I get a pass? Let me tell you the way it worked, because it wasn’t really improvisation. What we did was, we rehearsed in a hotel room for about two and a half weeks. There, it was improvisation. Out of that, it was set into a script. Because for the most part, improvising while cameras are rolling is very difficult. 99% of people you should never ask to do that, because they’re under pressure, the clock is running, 80 people are staring at you…it’s always unnatural. But the place to do it is in a quiet place where you have nothing to lose. So Marty would sit there and the actors would be there and Paul Schrader would be there. Out of that came a script. And then we stuck to the script when the cameras were rolling. Drive was similar. Drive was very well constructed, but there was a lot that wasn’t there especially because the actors hadn’t been cast yet. I was cast before Ron Perlman. When Nicolas [Refn] was looking for who Nino was…if he had chosen Steve Buscemi to play Nino, I think the dynamic between Bernie and Nino would have been different. But as soon as Ron came, I said to Ron the first night after rehearsal, we were walking to the car, and I said, “You know what this is, right?” And he says, “What is it?” I said, “This is George and Lennie in Of Mice and Men.” “I’m Lennie?” “Yes, of course you’re Lennie, Ron.” That gave us a place to go. Almost, Bernie feeling sorry for him, treating him almost mentally deficient. It gave a place for the characters to develop. When you use the word “improv,” it’s really not actual improv where you don’t know what you’re going to say when you get to the set. You sort of do that behind the scenes and when you get to the set, it’s written. Now sometimes, in my own movies, I would never ask other actors to do that. But if a character I had written for myself wanted to go on while the camera was rolling, I felt comfortable doing that, because I had written the character and I knew the character and Goddamnit if I thought of something really funny right there, I’m gonna say it. But I would never ask the other actors to do that, because it doesn’t work out well. You know what it does? All improv turns into anger. All comedy improv basically turns into anger, because that’s all people know how to do when they’re improvising. If you notice shows that are improvising are generally people yelling at each other. When you improvise on the spot, people are very reluctant to have soft moments or quiet moments or sad moments because they’re trying to fill up the spaces. So they always go towards, “How come you’re late?! You’re supposed to have my shirt ready! You call this a dry cleaner? !” You know? That’s what happens. That’s why improvising on the spot gets very dicey. Are you a little bit surprised by the critical reaction to Drive? A lot of people have also singled out your performance, especially. Brooks: You gotta be thrilled about it, that’s all! I’ve been on both sides of the coin. I’ve been where people have liked it and people didn’t like it. You’d be an idiot to say it’s not nicer if people like it. You want people to like it. If they don’t, you still go on and it doesn’t even mean that it isn’t great. It could mean a million things. 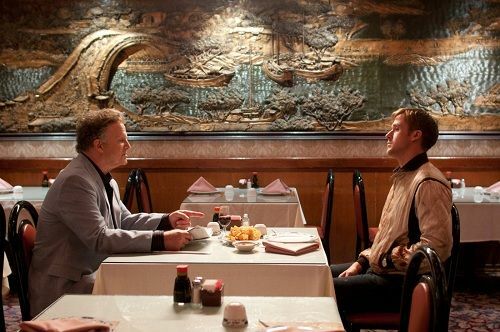 When Drive came out of Cannes with that bang, I was pleasantly surprised, let’s just say that. It wasn’t, “How in the hell could this happen?” but it doesn’t have to happen, you know? There’s nothing that says it has to happen. This sort of came out like a shot. And Nicolas won his Best Director award and people were really digging it there. I was on a book tour and I was really upset I couldn’t go, because I would have loved to have seen it. But then I watched it at the Toronto International Film Festival and it plays like a bat out of Hell. Because it’s a good movie! Whether or not it’s “too violent” or this or that, there’s so much style going on here. There’s so much craftsmanship. You’ve got to appreciate the movie for that alone. From some Twitter users: What’s the story with Defending Your Life eventually getting out on Blu-ray, as well as some of your other films? Brooks: Hey, you know, tell these people, “Let’s Occupy Warners!” I don’t know how those decisions are made. I’m trying to get the movies on Netflix free streaming, just because I’d like people to see them easily. And that’s a challenge. So I don’t know, man. I don’t know how the Blu-ray decisions are made. I think we need an Occupy movement. 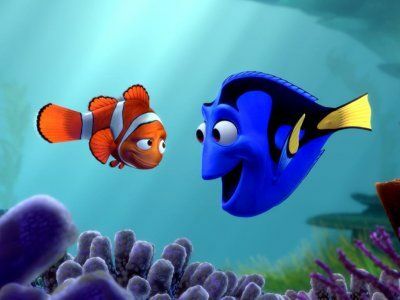 Pixar/Disney is re-releasing Finding Nemo in 3D next year. What are your thoughts? Brooks: Well, of all the Pixar movies, this might be the most interesting one to see what it looks like in 3D. It certainly has the visuals. It was so visual to begin with. As soon as I saw the success of The Lion King, I said to myself, “This has got to be next.” It only makes sense. What would the water look like, putting on the glasses? We’ll see. I’d imagine it’s going to look amazing. It looked amazing without 3D, so I’d imagine it’s going to be pretty interesting. It seems like people go to these things all over again. I know they’re doing the same thing with Monsters, Inc. in January. I guess this is a new business. You seem to make a film every six years, with the last film being made in 2005. We’re now in 2011, it’s been six years, is it almost time for you to announce you’re making another movie? Brooks: Yes, but my novel had to buy me an extra year at least. Brooks: Well, we’re going to see. Right now I wouldn’t mind devoting a couple of years to playing some really cool parts. I got my chops wet. Over the years, every time I made one of my own movies, I go to the sidelines as an actor for three years. I couldn’t stop. I turned down so many roles because if they’re giving you money to deliver a movie, you can’t say, “You know what, can I take the summer off and do this part?” So you take yourself out of the acting game. I would like to see what happens in the next six or eight months to see if there’s another Drive lurking that would be really interesting for me to do. If not, well, then I’ll do what I do again. I just sort of got my chops wet again as an actor and I have to say I’d like to repeat it if there’s something worth biting into. Is there a part over the last decade or two that you were offered that you turned down and still think about? Brooks: Well, I turned down so many parts. I couldn’t even begin to tell you. Dead Poets Society and Big and Pretty Woman. One part that I actually wanted to play, and I was in pre-production of my own movie, just because I thought I wanted to work with Paul [Thomas Anderson] was the part that Burt Reynolds got in Boogie Nights. I liked that whole ensemble. When I read that script, I really liked it. But I couldn’t stop, I couldn’t shut down what I was doing. But, regrets are stupid; they don’t mean anything and they don’t add up to anything.